HOW human do you think you are? Well, let’s play a numbers game: in terms of cell numbers, you have in the order of a trillion cells in your body, though this value varies greatly between people and is constantly changing within each of us. 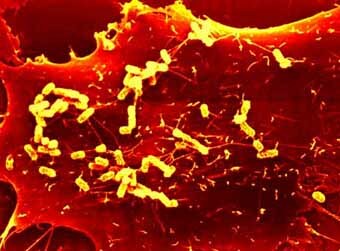 However, you have some ten times this number of bacterial cells within (and on) your body 1. So at one level at least, you are only 10% human. Of course, bacterial cells are quite a bit smaller than your cells, so there’s room for the both of you, in you. 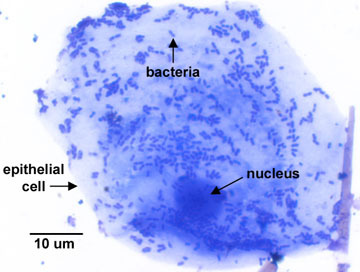 Images of human epithelial (tissue surface) cells coated with bacteria. In terms of genes, the instructions that make you you, humans have about 30,000. 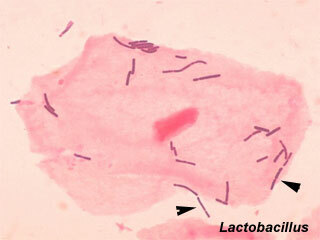 Again, there are in the order of a hundred times this number of bacterial genes operating within and on your body 2. So at another level you are only 1% human. Don’t worry though, of course you’re 100% human. Instead, we need to consider the extent of what being human actually is. Being human comes part and parcel with being a super-organism. We live in a symbiotic relationship with hundreds of different species of bacteria, without which we could not survive. Think of them as an invisible extension of your body’s innate defences, occupying every external surface, your skin, your gut, your eyes, ear, nose, and various other orifices. There is mounting evidence to suggest that they influence our development; our physiology; our nutrition and metabolism; and immunity, where they play an important role from birth in educating our immune systems. They are your interactive suit of armour, both part of the environment and part of you. These communities of bacteria are referred to as the microbiome, and they are being investigated as part of the Human Microbiome Project, an effort by many research labs coordinated by the National Institute of Health. It is a huge task as clearly we all have our own unique physiologies, influenced by genetics, epigenetics and environment (physical and nutritional). The question is: will there be a common microbiome shared by all of us? We also need to be able to culture the bugs, but alas, despite what you may think, the vast majority of bacterial species we suspect are out there (we have DNA evidence that they exist) are simply not culturable in the lab. An understanding of the microbiome can help us in many areas of medicine. It can help us to understand the implications of treating infections with antibiotics, how the resulting damage to your microbial shield can result in unhindered attack by harmful, non-resident, bacteria; and also how disruption to the normal microbial communities of your gut may effect your nutrition and metabolism. Conversely, in immuno-compromised patients, the microbiome that is normally in balance with your immune system may actually become an opportunistic invader itself, in the absence of immunity. Research may also help explain how disturbance to these communities may result in inflammatory bowl diseases such as Crohn’s disease and, more far reaching, how such disturbances can effect allergies and autoimmune diseases (diseases where your immune system attacks your own tissues). Indeed, it is thought that the microbiome might explain how and why individuals respond differently to external influences, such as individual variation in drug response, and idiosyncratic (unknown cause of) toxicity of certain compounds 3. On a more esoteric basis, the balance and numbers of micro-organisms in your gut can vary depending on your diet and nutritional status, and as such effect your metabolism; this, in turn, may have a knock on neurochemical or personality effect. So just ponder, next time you’re feeling grouchy, sure it could be your hormones, it could be stress, but it could also mean the “little friends” in your gut are unhappy about a current regime change. 3. Nicholson, J.K. et al. (2004) The challenges of modeling mammalian biocomplexity. Nature Biotechnology 22, 1268 – 1274. Next Post To whom are they selling…?